The objectives of this study were to evaluate noise levels generated during micro-suction aural toilet using an anatomic silicon ear model. It is an experimental study. In an anatomic ear model made of silicone, the eardrum was replaced by a 1-cm diameter microphone of a calibrated sound-level measuring device. Ear wax was removed using the sucker of a standard ENT treatment unit (Atmos Servant 5®). Mean and peak sound levels during the suction procedure were recorded with suckers of various diameters (Fergusson-Frazier 2.7–4 mm as well as Rosen 1.4–2.5 mm). Average noise levels during normal suction in a distance of 1 cm in front of the eardrum ranged between 97 and 103.5 dB(A) (broadband noise). Peak noise levels reached 118 dB(A). During partial obstruction of the sucker by cerumen or dermal flakes, peak noise levels reached 146 dB(A). Peak noise levels observed during the so-called clarinet phenomena were independent of the diameter or type of suckers used. Although micro-suction aural toilet is regarded as an established, widespread and usually safe method to clean the external auditory canal, some caution seems advisable. 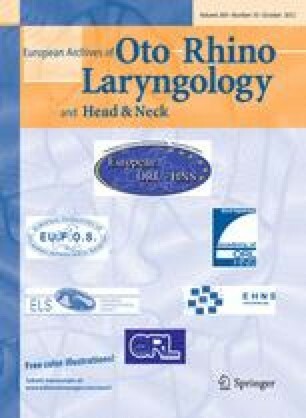 The performance of long-lasting suction periods straight in front of the eardrum without sound-protecting earwax between sucker and eardrum should be avoided. In particular, when clarinet phenomena are occurring (as described above), the suction procedure should be aborted immediately. In the presence of dermal flakes blocking the auditory canal, cleaning with micro-forceps or other non-suctioning instruments might represent a reasonable alternative. None of the contributing authors have any conflicts of interest, including specific financial interests and relationships and affiliations relevant to the subject matter or materials discussed in the manuscript.